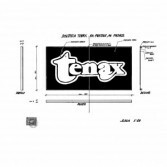 " The Tenax was born in September 1981, the period in which Italy was beginning to advance the new wave of music from the United Kingdom and the US, thanks to a group of young fans. The idea of ​​the Tenax project was to create a new disco concept, which sees the venue as a meeting point for artists, stylists and musicians, a sort of Florentine Greenwich Village. In those years, which were absolutely extraordinary, they played many groups including Psychedelic Furs, Spandau Ballet, Talk Talk, Tears for Fears, The Cult, Tuxedomoon, Sister of Mercy, Human League, DAF, Frankie Goes to Hollywood and, of course, to the protagonists of the local scene such as Litfiba, Neon, Alexander Robotnick and Magazzini Criminali. On this wave the Tenax became a point of reference for emerging artists and musicians both of the local scene and not but also for established characters such as Amanda Lear, David Byrne, Vittorio Gassman, Roberto Benigni and many others. Pursuing the original idea, Tenax also became a location for events connected to the fashion world, such as Pitti Uomo parties and Jean Paul Gaultier fashion shows, completing its path of constantly evolving premises, as will happen in the following years. The structure of the first volume, where reference is made to the '81 / '87 period, has both facades related to the Italian scene, namely the Wave with Neon, Litfiba and Frigidaire Tango and the more Italodisco with Gaznevada, Alexander Robotnick and My Mine. The two facades of the second volume were instead selected with the idea of ​​proposing the sound of the era to the Tenax, which mixed the Synthpunk, the Dark Wave and EBM. Not by chance appear names like Sister of Mercy, Chris and Cosey, Normal, Fad Gadget and other outsiders who have built a sound that today is a reference of many international producers, among other things some songs are very rare and particularly sought after by collectors . The images of the performances by Giovanotti Mondani Meccanici used on the cover have a very precise aesthetic reference, placing themselves in the period of Frigidaire and then Andrea Pazienza, Stefano Tamburini. For me it was very easy to process this material having worked on the Bolognese side in the same type of music scene in venues like the Small and the Artclub, which were the Tenax alterego at the time, and I also attended the Tenax in that period as a regular user. With Alex Neri we tried to build an aesthetic and musical story of a scene, which will be the natural mother of sound that will then become the protagonist of the next release on vinyl related to the 90s."